Your arm has 6 degrees of freedom and your scapula can move in 8 directions. That makes up 48 possible movements for your shoulder. 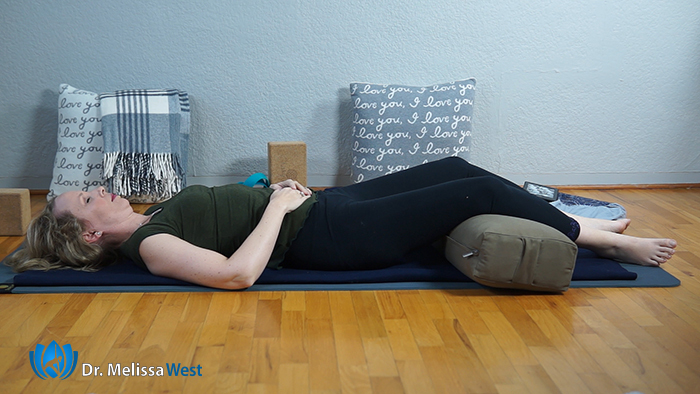 Yin yoga, although it usually targets the lower body, is also ideal for the upper body and the neck and the shoulders in particular because it targets the deeper yin tissues of our joints, ligaments, deep fascial networks and bones. 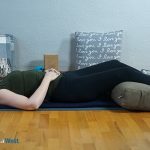 Since we experience our shoulders as being so tight, stiff, and tense, the qualities of yin which are yielding and allowing can be so helpful to embrace as we practice our yin yoga for neck and shoulders. 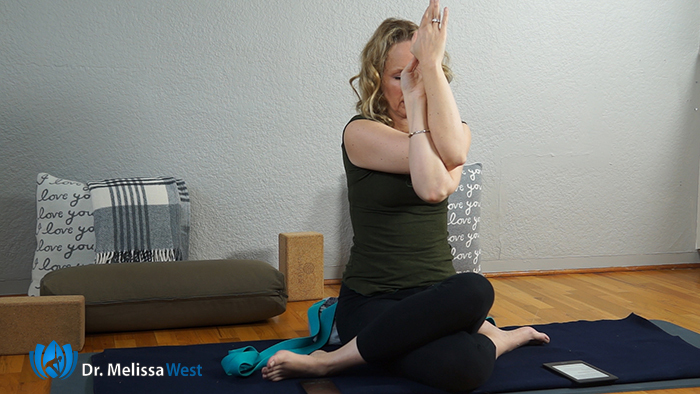 When the muscles are relaxed, the stress is moved to the ligaments binding the joint.This is why we continually relax our muscles in our yin yoga practice, to drop down into the deeper connective tissues in our body. Part of the essence of our yin yoga practice is to learn to yield. We can embrace the downward flow of gravity (another yin quality) to release tension from our shoulders. The deep yin tissues of our body are much dryer and less elastic than our superficial muscles. Muscles respond well to being warm with rhythmic repetitive movements. The yin ligaments remain cool and would get injured if they were treated in the same way. Instead they respond well to gentle pressure applied over a long period of time. That way they are stimulated to grow stronger. I love how Bernie Clark says, ¨we do not use the body to get into the pose, but we use the pose to get into the body.¨ We continually let go of our expectation of how the pose should look and tune into how they feel in our body. Releasing your neck and shoulders is not something you can do in just one yoga video. Just like brushing your teeth, taking care of your neck and shoulders a way of life and is something you can embrace everyday. The best way I have learned to care embrace the yin way of life is to make good sleep a part of my everyday life. I am going to share with you a good, better and best way to do that now. Best: The best way to release your neck and shoulders is to join our membership community. It is there that we can support you in releasing your neck and shoulders with our curated content. We have over 21 classes in our membership community dedicated to your neck and shoulders ranging from 5 minutes to an hour including connective tissue classes using the soft squash ball, the slo mo ball and the foam roller, shoulder shorts and long classes.